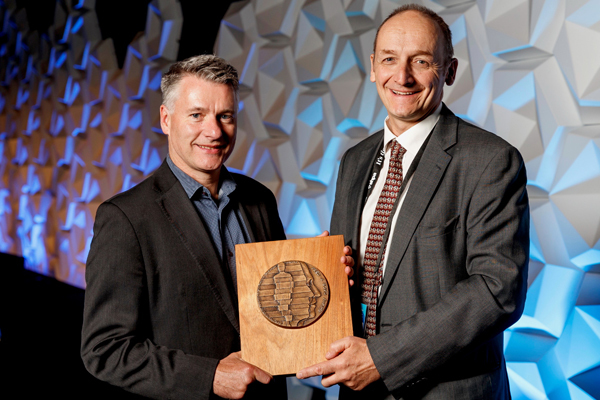 Royal Brisbane and Women’s Hospital Director of Pharmacy Associate Professor Ian Coombes was awarded the prestigious Fred J Boyd Award at Medicines Management 2018, the 44th SHPA National Conference. President Professor Michael Dooley awarded the prize on behalf of the Society of Hospital Pharmacists of Australia (SHPA) in Brisbane. Assoc. Prof Coombes encouraged the 1,200-strong delegation to ‘let go of things that hold you back’. “It is exciting and promising for the future of healthcare that Australian pharmacy has matured so rapidly in recent years,” Ian said. In awarding the prize, Professor Dooley celebrated the influence and broad reach of Associate Professor Coombes’ vision and leadership. “He has led many innovations in practice that have resulted in the introduction of many impactful, nationwide initiatives and has been instrumental in Australia now recognising advancing practice of pharmacists,” Professor Dooley said. “Ian’s commitment to professional development and innovation saw him lead the evaluation and development of the tools that became the Clinical Competency Assessment Tool (ClinCAT), which is now widely used in Australian pharmacy for self and peer competency-based evaluation and feedback.